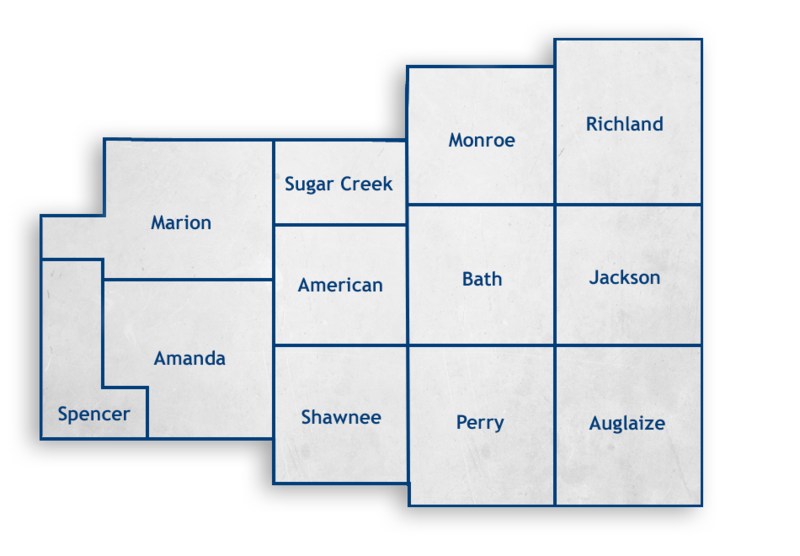 Allen County consists of the 12 townships depicted above: Amanda, American, Auglaize, Bath, Jackson, Marion, Monroe, Perry, Richland, Shawnee, Spencer and Sugar Creek. As a whole, Allen County has an area of 405 square miles and a population of 106,331 (2010 census). The county seat is Lima, Ohio, which lies in the center of the county. Allen County is the crossroads for two major cross country highways, Interstate 75, and a U.S. Route 30. Allen County also has an airport, which is located southeast of Lima, in Perry Township. The history of Allen County links closely to the development of the Northwest Territory. French and English explorers of the early 1700’s made the area a major fur trading center. Due to the vast, heavily wooded swampland formed by receding glaciers of the Ice Age, it was known as the “Black Swamp.” The first settlement in the county was Fort Amanda, constructed during the War of 1812 to protect Ohio from British invasion and Indian attacks. The conclusion of the War of 1812 led to further development of the Northwest Territory and the first permanent settlement in the area was in 1831. Allen County is named for Colonel John Allen, a participant in the War of 1812. Residents established the county on February 12, 1820. Lima was officially named and designated as the county seat and was incorporated in 1842. By the 1860’s, lumber and milling became the area’s major industry. With the rapid expansion of the Midwest in the 1850’s, Lima became a major junction point for five railroad freight and passenger lines. This resulted in the founding of the Lima Locomotive Works, the third largest producer of locomotives in the nation. The subsequent discovery of oil in 1885 made Lima/Allen County a major industrial retail trade center of the Midwest.